How can you help with Storm Water in Athens Clarke County? Every person who lives and works in Athens-Clarke County can do their part to ensure that the water we all depend on is safe for years to come. It doesn’t matter if you live in a one-bedroom apartment or a ten-room mansion, if you own a small hardware store or a business that sits on five acres, all of us can play a part by taking a few easy steps. Conserve water. Do not over-water your lawns and gardens. Water early in the day or late in the evening (between 6 pm and 10 am). Pick up after pets and properly dispose of the waste in the toilet. Keep pets away from waterside areas. Compost grass clippings and leaves. Do not allow them to be washed away into roadways or intentionally place them into storm drains or bodies of water. Take your car to a commercial car wash to conserve water and to prevent detergents and toxins from flowing into storm drains on bodies of water. If you must wash your car at home, do so on you lawn or some other pervious surface instead of in the driveway or street. Don’t overuse pesticides. Whenever possible use natural alternatives. Service your car regularly to avoid oil, antifreeze, and other chemical leaks. Maintain your septic system to avoid the pollution of groundwater, seepage, and runoff. Report a discharge to the proper authorities. Use dry methods for the clean-up of spills, such as cat litter or dry sweep compound. Do not hose spills, as the water will flow into storm drains. Recycle grease and oil. Do not pour them into sinks or onto parking lots or streets. Store materials in a safe place. Keep all toxic materials in their original containers. Make sure contaminated wash water and chemical discharges are disposed of properly. 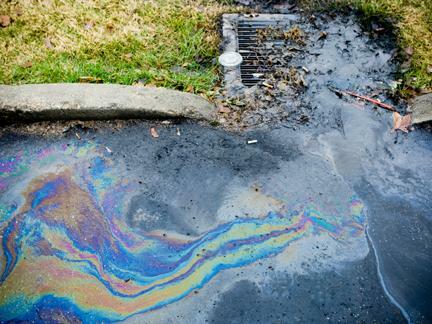 Do not dump wash water into storm drains. Keep your dumpsters clean and the lids closed, and make sure they are not leaking. Identify and conserve environmentally sensitive areas on your site and design your site around these areas. Use low impact site design principles. For “Better Site Design” development tools and tips visit the Center for Watershed Protection and the Georgia Stormwater Management Manual. 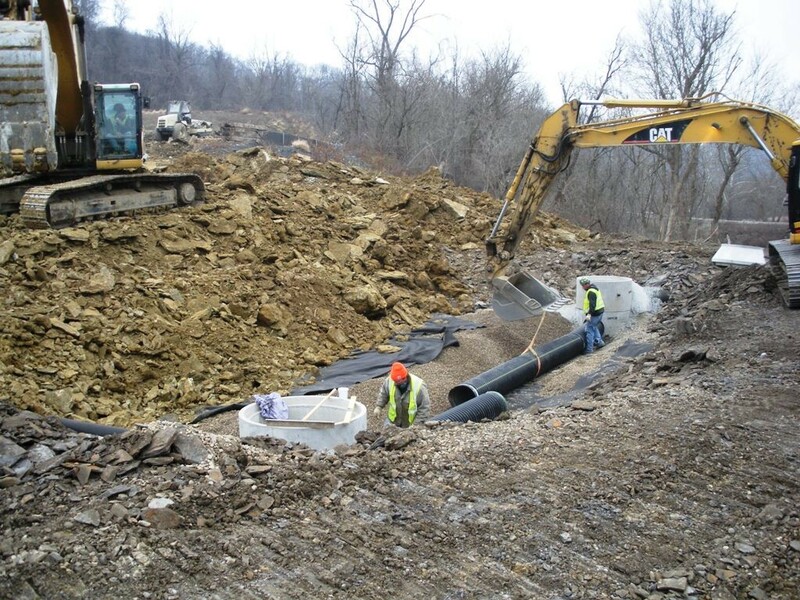 Implement and maintain aggressive erosion control measures to prevent sediment runoff. Locate your site away from any down sloping street or driveway, and any stream, lake, or drainage way. Maintain construction entrances, and clean up sediments daily by sweeping or scraping up soils tracked onto roadways. Prevent root damage of trees and shrubbery by placing barriers around plant life and limiting construction within those barriers. Re-vegetate through seeding and mulching, as vegetation is most effective in erosion control. The ACC Stormwater Utility Fee is a fee you shouldn’t feel bad about having to pay every month. Watch the video for more details. I unfortunately know this tip well, because I have suffered the consequences of not unclogging our toilet fast. The clog was especially “stuck” this time and I was taking a break from trying to unclog it. Well I forgot about it and went to work that morning. I remembered it at work but “no big deal” right?? Just a clogged toilet. Well little did I know that the valve inside my toilet was deteriorated and slowly leaking water into the bowl. So little you could not see it with the naked eye. Over the course of 9 hours though, this little bit of water turns into a lot. It overflowed, ran onto the floor, found its way down the floor air vent, traveled down into the basement, found a crack in the air vent and slowly but surely flooded my basement. I will NEVER leave a toilet clogged again!!! Unfortunately, clogged toilets are something that most people will experience at least once in their lifetime. Whether your child has flushed a toy, your flushing power isn’t enough to push debris through, or you’ve been flushing the wrong items, a clogged toilet can be a major inconvenience if you’re not sure how to fix the clog. The good news is that most clogged toilets will not require a visit from the plumber as they can typically be fixed quite easily. The first way to fix a clogged toilet is by using a good old fashioned plunger. If the cause of your clog is not a lodged item, such as a toy, a plunger is a quick and effective method of fixing the clog. To fix a clogged toilet with a plunger, the first step is protecting your floor in case of overflow or splashes. You can use newspaper or a towel to line the area around your toilet. You can also prep yourself by wearing rubber gloves and older clothing. The next step in unclogging your toilet would be to place a good quality plunger into the bowl of the toilet. To be effective, the plungers should make a seal around the hole in the bowl of the toilet while being completely submerged in water. If there is not enough water, add water from another source instead of flushing again. When your plunger is in the correct position, begin pumping the plunger up and down, starting off slowly. It may take a few tries, but eventually, the suction created will help dislodge the clog. Once you believe the clog is loose, try flushing again. If the toilet still seems clogged, add water and repeat the process. The next method you can use to remove stubborn clogs is creating a drain cleaner at home to help break up the clog. To create a drain cleaner, you will need baking soda, vinegar, and a half gallon of water that is hot but not boiling. Very hot water can cause damage to the porcelain that the toilet is made from, so think of hot tea or coffee as a good temperature measurement. Once you have the hot water ready to go, you’ll want to add one cup of baking soda and two cups of vinegar to the bowl of the toilet. The chemical reaction can be a great way to break up whatever is clogging your toilet unless it’s a solid object like a toy. After you’ve added the baking soda and vinegar, take the half gallon of hot water and pour it into the toilet from about waist level. The force of the water pouring into the bowl can help move the clog through. Allow the mixture to sit in the toilet overnight. In the morning, the toilet should be clog free. 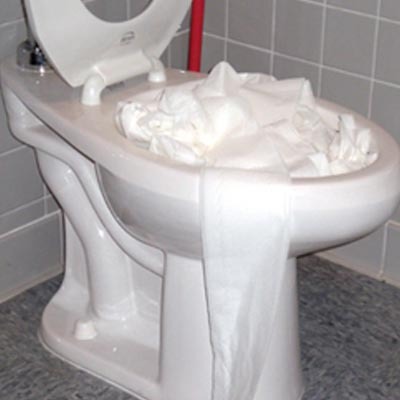 If it still remains clogged after a couple of flushes, you’ll need to try a method for hard obstructions. If you have a hard obstruction, such as a child’s toy or a bottle, in your toilet, the previous methods won’t be able to remove the clog. To remove a stubborn clog, you may need to use a wire coat hanger. A wire coat hanger can be used to push through a clog that isn’t too far into the pipe. To do this, you’ll want to unravel and stretch out a wire coat hanger. After you’ve got it straightened out, wrap a towel around one end and secure with duct tape. Push the wrapped end into the drain. If you feel the clog, push against it to try to get it to move along. If it seems to be stubborn, you can wiggle the hanger and maneuver it around until you feel the clog move and the toilet flushes freely. These methods for unclogging your toilet can be great when you’re struggling with a clog. If the methods above fail to work, a plumber may be necessary to help you fully evacuate the clog. Typically, most clogs will be quite easy to deal with, although there can be some more stubborn clogs. Always take your time when working on a clog and remember that it may take multiple tries to get it right. If you are local here in Athens, use a plumber like Carson Plumbers to help you out. They have been serving our business and our families for decades now. For all of our friends in Cardinal Nation, in St. Louis, we would recommend Emergency Plumber St Louis. I’ve personally used them 3 times and always been a pleasurable experience (minus the needing a plumber part though). So what can clogged sewer drains cause? Well how about flood damage to your house because the water has no where to drain. After a while this happens to your house and you have to clean it up! I would rather call a professional than have to deal with this nasty stuff. Sewer lines operate on gravity and will follow the natural slope of the ground. Most city-owned sewer lines will run quite deep and may be between eight and fifteen deep in spots near to homes from which the sewage is collected. Sewage lines that branch out from homes will be at least three feet deep and will lead to the nearest manhole on municipal sewers. Sewer drains getting choked can cause a serious problem of flooding and result in unsanitary conditions that can turn out to be life-threatening if not attended to in time. Blockage in drainage outlets can often be a localized problem and confined to one fixture like a toilet, bathtub, sink or laundry drain. It is is often the result of requiring the drain to carry away debris that it is not designed for. This debris will not get carried away and will act as a nucleus to gather further debris until the entire flow in the drain is blocked and prevents the sewer from flowing freely. Most sewer blockages are noticed in the toilets that have the biggest drain line and are often connected directly to sewer lines. Bathtubs and showers would show the signs of a sewer line before kitchen sinks as they are located at lower levels. First signs of a blockage that will ultimately lead to flooding in the home may be noticed in the toilets or sinks that are in the lowest areas of the home, like basements. Another sign of sewer line blockages that can lead to flooding is from unusual events like sink taps producing bubbles in the toilets, when they are operated, or water in the toilet rising instead of draining away. Blockage in sewer lines outside the home may lead to water coming out of the catch pits or manholes to which all the drainage from the house is connected. 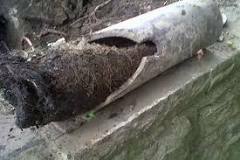 These blockages can also be caused by tree roots getting into sewer lines. It can cause flooding in the yard, and if the water is black water, from the toilets, this can lead to unsanitary conditions developing, which give rise to the growth of bacteria and fungus. There will also be the odor of sewage. A gurgling sound in a sewer system is often an indication of a problem developing that needs immediate attention. Floor drains in bathrooms and other areas in the home are often the first to indicate signs of a sewer line blockage, as water will overflow from then till the drains can carry it away. A sewer line blockage must be considered an emergency and must need the attention of experts. Left unattended, this can lead to water flooding all the lower areas of a home and leading to damage to floors, furniture, and fixtures. Formation of mold is inevitable in areas that are always damp, and the spores from the mold can cause serious respiratory problems, especially among children and the elderly. Close off all water connections and refrain from using bathrooms and other things connected to the sewer mains, till you get in plumbers who can attend to and clear the blockage in the sewer lines. After a flood has happened inside of your home or business, a local water damage restoration or mold remediation company will probably have to be contacted to assist with the mess and cleanup. Both of these companies can handle any type of water damage restoration, mold remediation, or flood damage problems. This is just an example of some of the things we do to dry out houses and commercial buildings. It’s a dirty job but somebody has to do it! Should you physically beat up your customers? Of course not. If your employees are beating up customers in order to enforce company policy, clearly they haven't been taught the skills of effective decision making. GC3’s penchant for expertise and innovation expanded in 2019 with the hiring of Dave Bell and Daniel Lewis. Their hires signal a dynamic approach to company growth and enhanced industry expertise. Next Gear Solutions, developer of the leading job management software solutions in the restoration industry, is proud to announce that registration for its second annual user conference, Next Gear Solutions CONNECT 2020, is now open. CONNECT is once again being held at the Hyatt Regency in New Orleans, LA, January 14 – 17, 2020. The Institute of Inspection, Cleaning and Restoration Certification (IICRC) is seeking volunteers to serve on consensus bodies for the development of a new Standard, the BSR/IICRC S900 Standard for Professional Remediation of Illicit Drugs, Cannabis and Nicotine Residue.